a cynical little boy who's soured on the whole idea. Filmed At: Screen Gems Studios, Hollywood, CA, and on location in Los Angeles, CA. Teleplay by Neil Burstyn; Story by Dave Evans & Neil Burstyn. �R�u, Ch�u,� Arranged and adapted by H. Diltz, C. Douglas, C. Faryar, J. Yester. The Monkees arrive at The Vandersnoot Mansion on Christmas Eve expecting to perform at a party. When the butler greets them at the front door, he tells them four gentlemen were expected, perplexed by their long hair. Michael declares that they're "four ladies who shave," and are allowed inside. Peter envisions a plethora of Christmas presents to buy his mates with the resulting money, but Michael suggests he skip getting presents like he did the previous Xmas: a non-fitting sports jacket for David, a chemistry set for Micky which changed him into a monster, and an intelligence test for himself which short-circuits on account of his total stupidity. (Their gifts proved so terrible, Michael had to wait until the next July to open his gift, which turned out to be a pair of snow skis.) But to their surprise, Mrs. Vandersnoot is instead planning a Christmas cruise and wants The Monkees to baby-sit her 12 year-old nephew Melvin, who refuses to go with her and offers them $100 each in advance for the 10 days. They soon see that Melvin is a cynical twelve-year-old soured on the whole Christmas racket, who accompanies them to their pad rather than go with his aunt. Back at their pad, the guys try to entertain Melvin with Michael playing Simple Simon with him, Micky trying to impress him with a yo-yo trick and David trying to be his pal, but Melvin unaffectedly resists all The Monkees� efforts and sneers at them for acting like such kids. Sure the rich kid will enjoy Christmas shopping, The Monkees take him to a department store, but things go awry when Peter tries out a motorcycle which goes too fast, and he almost wrecks the place as he crashes into toys, cloth and a Christmas tree, while Melvin remains a bored onlooker. The guys are charged $320 for damages plus $20 for the stretcher they use to carry Peter out. Back at the pad, when Peter is examined by a doctor who charges $20 for medical bills but decides to only charge them $19.95 since it�s Christmas, Melvin doesn�t understand how they can enjoy Christmas so much and thinks they�re stupid to feel Christmas is special. The guys try to explain to him what Christmas is, he rejects the idea. Michael tries to again to tell him that the Christmas spirit can be even in the form of a smile and urges Melvin to try to do so, but the boy is unable to and he spats �Bah! Humbug!� at them. The guys realize that Melvin has a lot to learn about Christmas and are even more determined than before to help him. First, they take him out to buy a Christmas tree, and Michael finds a small evergreen tree which he uses to show Melvin the distinguishing characteristics of a Christmas tree, when suddenly he gets into a tug of war battle with a little old lady over the tree, ending with the lady pelting him with a Karate Chop. Well, all the other small trees are gone, and a big tree is too expensive, so Michael hatches an alternate plan: go to the forest for a Christmas tree. Michael tries to chop down a tree only to wind up getting bad vibrations having struck petrified oak, so he sends David and Peter to buy a Christmas tree instead. As if all this weren�t bad enough, Micky shows the others what he believes to be holly and mistletoe but it really is poison ivy and back at the pad, the guys use the remaining $30 of their Xmas money to the doctor, for Micky who has now broken out in a rash. Furthermore, they decide to show Melvin how to decorate the Christmas tree but, when David gets a concussion after falling off a ladder trying to put a star atop the Christmas tree, winding up with bandages on his head. Since they used up all their Xmas money, the doctor decides to instead charge them after Christmas (business has been picking up!). A still unmoved Melvin lambastes the boys for nearly killing themselves over something that doesn�t exist and when Michael replies that Christmas doesn�t exist as long as you don�t believe it to, an angry Melvin decides to leave and return to the mansion and they guys give up. The Monkees are still confused about Melvin�s aloof attitude since they went for broke, physically and financially, doing everything from taking him shopping to hunting for Christmas trees, until Michael realizes that they tried everything but love. Back at the mansion, Melvin encounters the butler and maid who plan on going out for a Christmas Eve dinner and Melvin insists that he�ll be fine without them so they leave. All alone in the empty mansion, Melvin grabs a plate and while looking at his reflection he tries to smile again with still no success and soon breaks down in tears. Then he sadly pictures the fun he might have had with The Monkees in the department store and at their pad had he shared the boys� feelings for Christmas. Micky and David, as Santa Claus and his elf, respectively, climb up on the roof of the mansion planning on sliding down the chimney; the two crash down and emerge from the fireplace all covered with soot. Michael and Peter arrive carrying a Christmas tree, and soon The Monkees run through a clumsily-harmonized chorus of the Christmas Carol �Deck the Halls.� Finally overcome by emotions, Melvin, to everyone�s surprise, begins to laugh, get hysterical and cry. The guys surprise Melvin even by bringing his aunt, Mrs. Vandersnoot to him, and and Melvin, finally caught in the spirit of Christmas, runs into her arms, declaring how they missed each other. Melvin begins to tell his aunt of all things he did with The Monkees as he opens his present (a basketball!) on the couch with Micky and David, while Peter and Michael happily look on in tears. After Peter, Michael, David and Micky sing an a capella rendition of the Old Latin Christmas Carol, �R�u, Ch�u,� The Monkees introduce their soundstage personnel as the end credits superimpose over them. “The Monkees Christmas Show” is one of 3 second-season Monkees scripts involving Dave Evans; the others were those for Episode No. 53, "The Monkees Race Again" (a.k.a. "Leave The Driving To Us") (with Elias Davis and David Pollock), and the teleplay of No. 58, "Mijacogeo" (a.k.a. "The Frodis Caper") (with Micky Dolenz). Evans took a much-needed break during the first phase of second-season episode filming, between April and June 1967. With “The Monkees Christmas Show”, assistant director Jon (C.) Andersen directs for the second and final time on The Monkees; the first being Episode No. 42, "The Wild Monkees". Andersen would later on direct “Christmas Show” guest Larry Gelman and Monkee guest alumnus Booth Coleman (“The Spy Who Came In From The Cool”) in the April 3, 1970 episode of The Flying Nun (ABC, 1967-70), "No Tears For Thomas" (its last). The set that was used as the Vandersnoot mansion in this Christmas episode was reused as Kibbee Manor in Episode No. 55, "The Monkees Mind Their Manor." The end credits to the "Christmas Show" credit Jill Chandler as Salesgirl, but its original Screen Gems storyline lists Toby Adler in the role! The storyline also reveals a deleted plot twist which sees Michael and Peter, with guitars, getting tangled in a Xmas tree with the ersatz Santa (Micky), and a different ending with the backstage crew joining in on Christmas carols. Take note of the two members of The Monkees production crew introduced by the boys during the closing credits, both of whom never received any screen credit: sound recordist Les Fresholtz and property master Jack Williams. Williams would cameo in 2 episodes in the last half of The Monkees' second season: the Customs Man in Episode No. 55, “The Monkees Mind Their Manor,” and the Stagehand in Episode No. 58, "Mijacogeo" (a.k.a. "The Frodis Caper"), The Monkees' series finale. (At the end of “The Monkees Christmas Show”'s closing credit sequence, Micky can be heard shouting "Frodis forever! ", which foreshadows "Mijacogeo".) Columbia Pictures later hired Fresholtz and Williams to work on The Monkees' feature film HEAD. And artist Neko Cholis, who can also be seen in the crowd, would later on design the cover for The Monkees Present Micky, David, Michael. For the fantasy montage featuring Melvin sharing the Christmans spirit with The Monkees, the show's background music composer-conductor, Stu Phillips, adapts the following Christmas carols into the musical cue accompanying the scene: “Ríu, Chíu,” "The 12 Days Of Christmas," "We Wish You A Merry Christmas," "Deck The Halls," and "Jingle Bells"; Stu even manages to sneak in a non-Christmas-oriented tune, "Pop Goes The Weasel" (as Melvin is seen playing with a jack-in-the-box). The Monkees, of course, can also be seen singing "Deck The Halls" and “Ríu, Chíu” in this segment, and Stu Phillips' "We Wish You A Merry Christmas" sting can be heard towards the end of the closing credits. Here, all 4 Monkees are seen singing “Ríu, Chíu” live. Undoubtedly they must have lip-synched to their own vocals which they cut on August 24, 1967 at RCA Studio B in Hollywood during the Pisces, Aquarius, Capricorn, & Jones, LTD. sessions. An actual studio version which featured Micky, Michael, Peter, and producer Chip Douglas (who had previously performed it with The Modern Folk Quartet) was recorded October 3 that year at RCA Studios, and was not released until Rhino's January 1990 release of Missing Links Vol. 2 (R2 70903). Collector's Note: The TV version of “Ríu, Chíu” has been included as a bonus selection on Disc 1 of Rhino's July 10, 2007 2-CD Deluxe Edition reissue of Pisces, Aquarius, Capricorn & Jones, Ltd. (R2 77767). A third (and final) repeat of “The Monkees Christmas Show” on CBS Saturday December 25, 1971 occurred 4 years after its first (and only)-run telecast on NBC. Postproduction on Episode No. 54, "The Monkees In Paris" (a.k.a. "The Paris Show") (wraparound segments in the beach pad), the last portion of production on The Monkees TV show, wrapped 24 hours before this episode's first-run telecast on NBC. Following completion of “The Monkees Christmas Show,” The Monkees, Bob Rafelson, Bert Schneider, Jack Nicholson and assistant manager Brendan Cahill took a trip to the resort town of Ojai, California to vent ideas for the screenplay of the group's impending movie. This Christmas episode is the only holiday-themed episode of the entire Monkees series---which, surprisingly, was shot in the week of Thanksgiving! It is also the only episode of The Monkees to have a special end credit sequence. Trivia Footnote: The version of "Christmas Show" as aired in December 2000 by Screen Gems Network did not use these end titles. “The Monkees Christmas Show”'s end credit sequence is also the only time Micky Dolenz is the first Monkee credited instead of David Jones; the end credits of The Monkees' feature film HEAD have Peter Tork the first Monkee credited. “Ríu, Chíu” is translated as "Roaring River." Michael Nesmith's rendition of "Deck Us All With Boston Charlie" is in reference to the Walt Kelly strip, Pogo. In the scene where he helps trim the tree, David is seen wearing a white Nehru shirt. He will wear a similar one in Episode No. 46, "The Monkees On The Wheel", and No. 51, "The Monkee's Paw". In his disguise as Santa's elf, David wears Michael Nesmith's green wool hat and a green shirt previously worn by one of The Jolly Green Giants in Episode No. 19, “Find The Monkees!” (a.k.a. "The Audition"). 180 x 3 ÷ 2 - 7 equals 263! (Oh, everyone knows that!) BTB, the blackboard Micky uses to calculate this rather difficult problem (given by Melvin, of all people!) is reuses in Episode No. 51, "The Monkee's Paw", in the scene where Peter, Michael and David (in black professor's gowns) give Micky a speech lesson. This Christmas segment finds Michael Nesmith being pelted with a Karate chop for the second time on The Monkees. The first was in Episode No. 5, “The Spy Who Came In From The Cool”, during the discotheque climax in which he is slugged by enemy spy Madame Olinsky (Arlene Martel). In the scene where Michael and David coach Melvin in how to smile, Melvin blurts out, "Bah! Humbug!" This immortal 2-line exclamation echoes that of Ebenezer Scrooge, that cherished (and soon-to-be-reformed) miser of Charles Dickens' classic 1843 novel A Christmas Carol, whose popularity continues to flourish in the various film and TV versions that have been made of it. In the scene from Episode No. 3, “Monkee Versus Machine”, in which Daggert (Stan Freberg) is given the boot by toy factory president J.B. Guggins (Severn Darden), Daggert is heard fuming the same line. And a jab at another central character from A Christmas Carol, The Ghost Of Christmas Past, was made in Episode No. 2, “Monkee See, Monkee Die”. 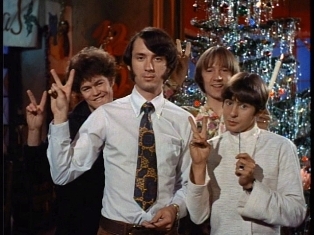 Prior to the fantasy sequence in which he joins The Monkees’ as they enjoy Christmas, Melvin looks at his reflection in a dinner tray trying to smile, and he sees images of Peter, David, Micky and Michael doing the same thing. By the by, the image of Micky grinning (compleet with tablecloth!) is gleaned from the interview segment of Episode No. 35, "Everywhere A Sheik Sheik". Peter's one-liner, "Yeah, cool. Machine.," is in reference to the character Brenda in Episode No. 38, "I Was A 99-lb. Weakling" (a.k.a. "Physical Culture"). The late Jeanne Sorel (Vandersnoot) appeared in a February 12, 1970 episode of Bewitched (ABC, 1964-72), "What Makes Darrin Run?," with Monkee guest alum Arch Johnson (“The Chaperone”), and with Paul Sorenson (“Monkees A La Carte”) in an October 30, 1969 episode of the series, "To Trick-Or-Treat Or Not To Trick-Or-Treat". Butch Patrick (Melvin) is best known for his portrayal of Edward Wolfgang "Eddie" Munster on The Munsters (CBS, 1964-66). Almost a full year before this Christmas episode's networkcast, Patrick appeared in a December 26, 1966 episode of I Dream Of Jeannie (NBC, 1965-70), "My Master, The Author," with Monkee guest Mary Foran (“I've Got A Little Song Here”). The late Rege Cordic (the doctor) pops up again on this show in the next episode, "Fairy Tale," as The Town Crier/Narrator. Cordic loaned his voice for a number of cartoon series including Hanna-Barbera's Jabberjaw, Dynomutt, Dog Wonder (both ABC, 1976-78) and The Pirates Of Dark Water (Fox, 1991-92), and Marvel/Sunbow's Transformers (Synd., 1984-87). Other Hanna-Barbera cartoon voice artists to appear in guest roles on The Monkees are Henry ("Mr. Babbitt") Corden, Sherry Alberoni, Heather North, Cliff Norton, Michael Bell and Hamilton Camp; Micky Dolenz, a series regular, would also lend his voice to several Hanna-Barbera projects, starting with The Funky Phantom (ABC, 1971-73).